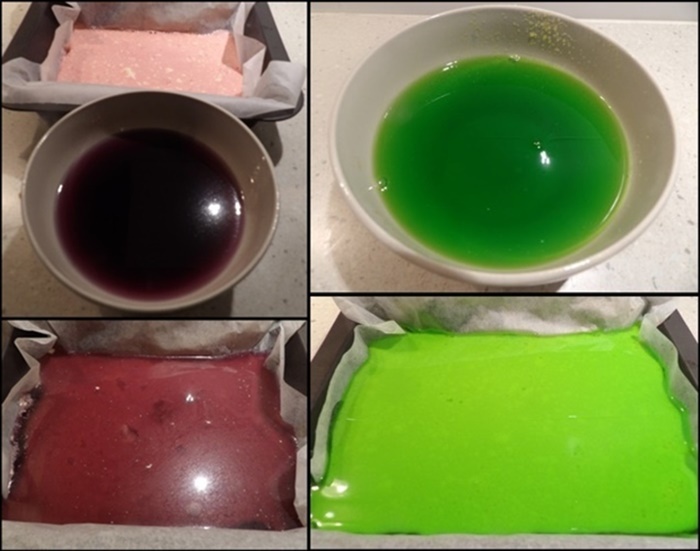 This fun dessert takes a long time to make, however you do not have to sit around and wait while each colour jelly sets. It is a striking dessert which will impress even the best of chefs/friends! This is quite easy to make - it just requires time in between for each layer to set slightly. It should not be totally set in between each layer, and you need to let each layer cool a bit before pouring it onto the partly set jelly from the fridge. 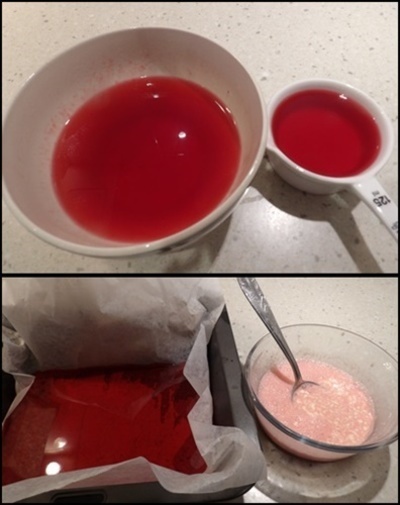 Dissolve the first colour of jelly in 1¼ cups of hot water. Stir very well. Take out ½ cup and leave aside. Put the rest (¾ cup) into a 20 x 20 cm pan. I put baking paper on the bottom though this stuck quite badly to the jelly. Put in the fridge for about 15 minutes or until it is set but not set completely. Add 3 tbsp of sour cream to the ½ cup that you kept, and mix until it is well blended. Gently pour this on top of the partly set jelly that you took out of the fridge. Allow it to set again for about 10 -15 minutes - depending on how cold your fridge is. Repeat with the remaining jellies. You will possibly need to make your fridge time shorter when you put the sour cream layer in the fridge, as this has already sat on the bench for a while. Once you have done them all, put in the fridge till it is completely firm and set. Cut into squares, whatever size you want! Add a dollop of cream on to each one, if desired. The sour cream layer on this dessert not only makes it look good but also gives the jelly a slightly creamy, delicious flavour.